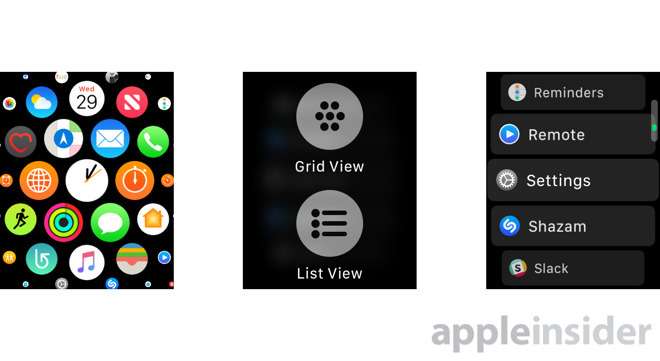 By default an Apple Watch uses a "honeycomb" view to browse installed apps, identified only by their icons. watchOS 4 includes an optional, more straightforward List View —here's how to turn it on. Contrary to what you might expect, there's no way to do this from the Watch app on your iPhone. Instead, on the Watch itself, begin by pressing the button on the Digital Crown, which will bring up the app switcher. Press down firmly on the display to invoke a Force Touch menu with "Grid View" and "List View" options. Tap on the latter, and the mode will change instantly. List View arranges apps into alphabetical order, with text labels marking each one. This can make it easier to find apps if Grid View seems too cluttered. Since you can't reorder List View like the Grid, however, there's no way of clustering together frequently-used apps. Reverting is simple —press down on the screen when looking at List View, then select the old setting when the Force Touch menu appears.